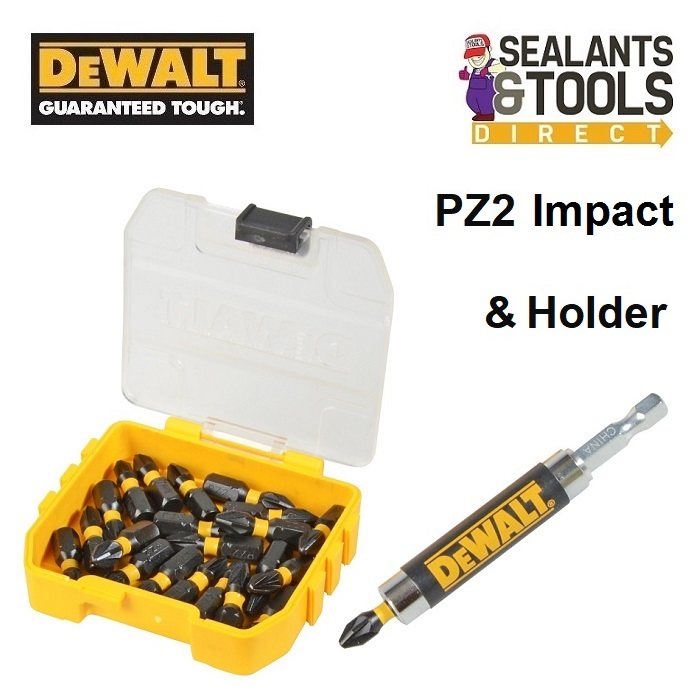 Impact drivers are extremely popular with tradesmen and are used for tough and extreme screwdriving application, such as putting 10 to 20cm long screw fixings in sub frames for decking and similar applications, where a normal Combi-drill or drill driver would fail. 25 x PZ2 25mm bits, with a built in Torsion zone to absorb peaks in torque. Supplied with a magnetic Self Retracting Screw Guide bit holder. Due to the force an impact driver exerts, the screwdriver bits need to be specially engineered to cope without shattering or the tip breaking. These Extreme 3 ‘Torsion’ impact screwdriver bits from DeWalt have been specially designed for use with impact drivers, but they can be used with any cordless drill as well. The traditional Pozidriv No.2 head has been finely machined and hardened, and will fit a wide number of screws. Below the head is a waisted body which is covered by a yellow sleeve, this part of the bit has been hardened to a lesser degree than the tip so as to provide a degree of flex when the fixing is fully inserted, this flexing (or Torsion zone) greatly reduces the risk of the tip breaking. Comes complete with a magnetic Self Retracting Screw Guide bit holder simply pull forward the guide to help hold even the longest screws, this sleeve automatically retracts out of the way as the screw is inserted, the bit holder can be used also in the normal way.